Edmonton was founded on the banks of the North Saskatchewan River and served as a Hudson’s Bay Company trading outpost that grew to become Canada's Gateway to the North and Alberta’s Capital City, with a population of over 1.3 million people. Edmonton has an open and welcoming atmosphere, and is home to one of the most diverse populations in Canada. 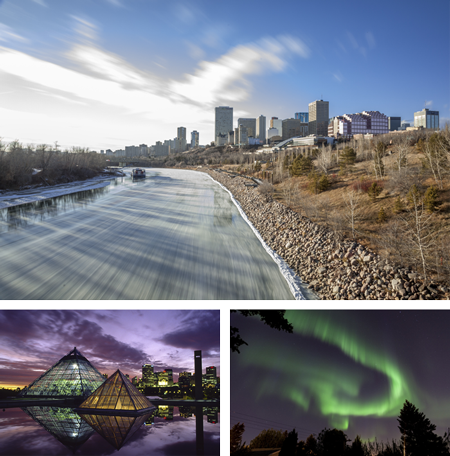 Also known as the Festival City, Edmonton showcases its local and international talent and diversity through various festivals like its annual Heritage Festival and the second largest Fringe Theatre Festival in the world. Boasting the longest stretch of connected urban parkland in North America, Edmonton is also a wonderful place to get outside and enjoy nature without leaving the city’s limits. From mouth-watering restaurants and cafés, to numerous outdoor activities and festivals, to the Telus World of Science, and the Royal Alberta Museum, there’s something for everyone here! And of course, we can’t forget that Edmonton is one of Canada’s best places to view the Northern Lights. Join us in exciting Edmonton for GeoEdmonton 2018! Edmonton has been included on Travel and Leisure's list of the 50 Best Places to Travel in 2018 – the city's many museums and dining experiences are highlighted in the writeup. To learn more about Edmonton, visit exploreedmonton.com. Please see the map below to discover some of the top attractions in Edmonton!